Milan 2015: Scholten & Baijings has covered a selection of Herman Miller furniture in fabric that features a nine-metre repeat of geometric patterns (+ slideshow). Stefan Scholten and Carole Baijings are presenting the furniture as part of an installation at American furniture manufacturer Herman Miller's showroom in Milan. The show – named Lines, Blocks and Grids – pairs fabric the Dutch duo designed last year with chairs that have just been launched for the European and Middle Eastern markets. Lengths of the nine-metre repeat fabrics have been draped over bars hanging from the ceiling to create a backdrop for the furniture, as well as tableware and vases also by the studio. "We placed Herman Miller furniture in front of the textiles, not necessarily with matching patterns, showing what you can do with the fabric," Stefan Scholten told Dezeen. 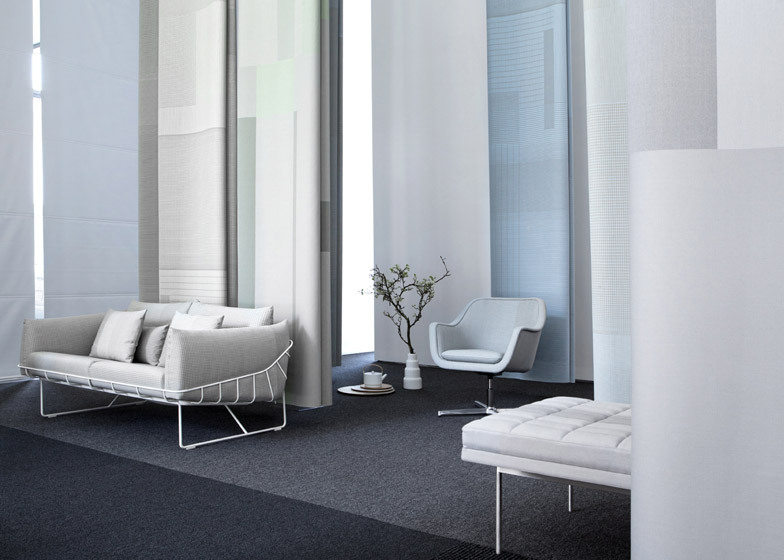 Scholten & Baijings designed the wool fabrics with patterns large enough to upholster an entire sofa without repetition. "Since we are product designers we think first of the couch, of the product, then the textile," said Scholten. "It allows you to create an upholstery that is every time unique." This is the 19th year the duo have shown products during Milan design week. "We don't join a lot of design weeks. We do Milan, then Tokyo design week for the Japanese market, and then NeoCon for the American market", said Baijings. "There are so many, we wouldn't have time to design anymore." "There is too much on offer in Milan," Scholten told Dezeen. "People just want to sell their designs. But then it is still the place for designers to show new products because of that, everyone is here." The fabrics the pair are showing are Grid, which has blocks of grids in different densities and Blocks, a pattern of squares and rectangles in different tones. Both are available in a variety of colours, from pastel yellow to deep orange. The fabric was created for New York textiles brand Maharam, which was bought by Herman Miller last year. The duo have upholstered four pieces of furniture by American designer Ward Bennett. His well-known designs include a chair for former President Lyndon Baines Johnson. Bennett's classic 1964 carved ash Landmark chair and his swivel Bumper Lounge Chair have both been upholstered in Scholten & Baijing's grey Grid fabric. The seat of Bennett's Sled chair, which has a steel X-shaped base and is usually upholstered in black leather, has been covered in grey Block fabric, along with two sofas: Bennett's Rolled Arm Sofa and the Tuxedo Bench by BassamFellows. The designers have also upholstered contemporary furniture, including the Wireframe Sofa and Ottoman designed by Industrial Facility's Sam Hecht and Kim Colin in 2012. 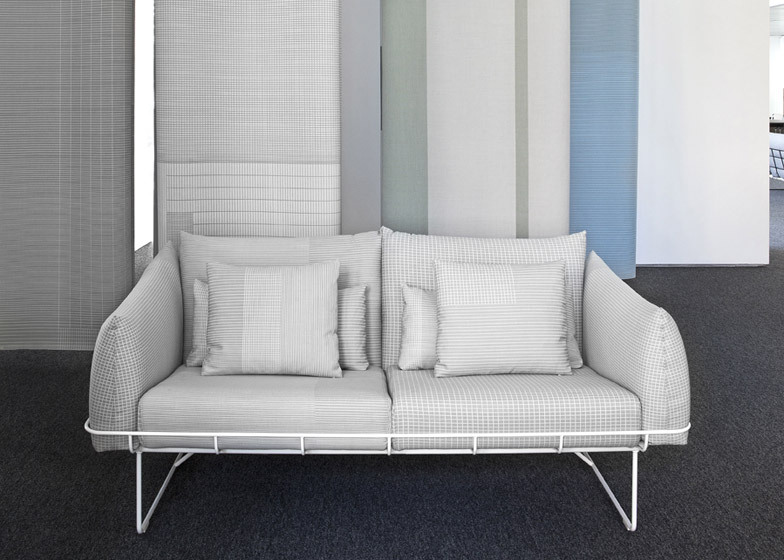 Rounded cushions covered in grey Grid fabric are wedged into skinny wire bases. Lime green Grid fabric covers the square cushions of Belgian architect and designer Vincent Van Duysen's low wooden-framed Brado Lounge Chair. Scholten & Baijings are presenting a number of products in Milan this year, including a sofa for Moroso and a titanium travel flask for Italian grappa brand Nonino. Lines, Grids and Blocks is on show at the Herman Miller showroom, Corso Garibaldi 70, until 19 April.